The very fine Toronto Sports Media is reporting that Andrew Krystal has been fired from Sportsnet’s the Fan 590. You may recall Andrew Krystal was the morning guy on the Fan 590 until he lost that gig in February to Greg Brady and Jim Lang. Speaking of Brady and Lang, what do you guys think about their morning show? Also, are you as underwhelmed by Mike Richards on TSN 1050 as I am? Which of the two do you prefer? If you're my age, and you grew up listening to The Fan 590, try to remember a time before Howard Berger. Love him or hate him, and the disdain for this man in the Twittersphere is intense, you knew him and you listened to his Leafs reports. Toronto Sports Media is reporting he's been relieved of his duties at Sportsnet Fan 590. This YouTubery is aptly titled "Ron Wilson Destroys Howard Berger". And no, there's no truth to the rumour that Colin Campbell has been hired by The Fan 590 as Berger's replacement. What's happening at CKLN-FM? 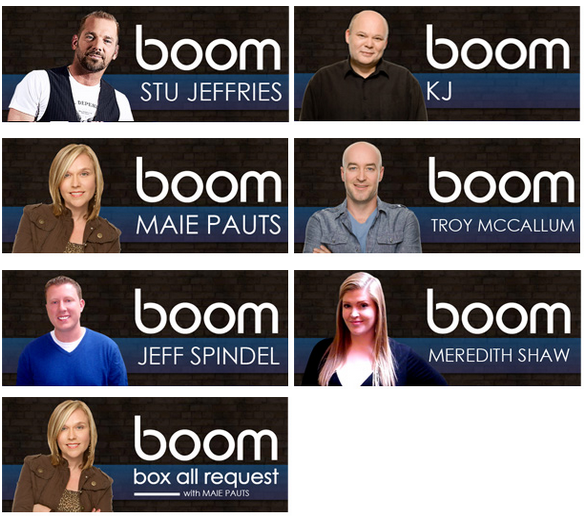 The Ryerson-based station had its license revoked by our friends at the CRTC. They have to cease broadcasting by February 12, 2011. Here's an email I just received about the decision. I've been expecting you to get up the lightning bolts and thunder at the CRTC for axing my radio station, CKLN.FM 88.1 Friday. A harsh blow, that came to light during my show, with one of the comissioners actually presenting a lengthy criticism of the decision WITHIN THE REPORT. Rumours and disparagements focus on the unresolved messes left for us at CKLN over a decade of tumult. The sincere efforts of the struggling board and volunteers committed to good radio are being ignored and misrepresented so that a conservative agenda can set precedents for strong-arm tactics in all alternative media. Could you look into this, please? Beware, Toronto, beware, Canada, beware especially, the next generation. I just read the decision. In this decision, the Commission revokes, by majority vote, the broadcasting licence for CKLN-FM Toronto, held by CKLN Radio Incorporated, as of 12 February 2011. In reaching this determination, the Commission considered the serious and continuous nature of the licensee’s non-compliance with numerous regulatory obligations, the station’s inability to institute the measures necessary to ensure ongoing compliance, and the lack of confidence on the part of the Commission that such measures could or would be instituted within a reasonable amount of time. The licensee must cease broadcasting on 12 February 2011, by no later than the end of the broadcast day. What follows is a pretty lengthy list of non-compliance examples, and all the warnings CKLN got. What's interesting is the opinion of Commissioner Louise Poirier. Here's what Poirier wrote. Hastily revoking a campus radio station licence in Toronto, Canada’s biggest market, will not send a positive signal to the campus radio community, which consists of organizations comprised mainly of volunteers, who unstintingly contribute time and energy to give their community a voice. This decision is consistent neither with the Commission’s usual practice nor with the spirit of Circular 444. In my opinion, based on the evidence before us, the decision to revoke the licence at this time is premature, disproportionate and inequitable. Does the CKLN board have any recourse? What happens to the frequency on February 13? What do you Ryerson students think of this decision? There's a lot of Toronto sports media movement this week. I've just heard Mike Richards is leaving Calgary for a spot on TSN Radio. 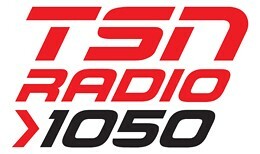 Wait... there's a TSN Radio now? How long was I sick? Here's a nice email about it that I just received from Adam. 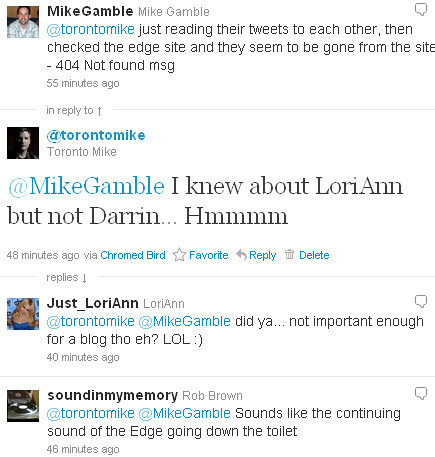 As a follow-up to your post from June (https://www.torontomike.com/2010/06/is_the_mike_richards_show_comi.html) Mike Richards resigned today from CFAC-AM (Sportsnet Radio, Fan 960 – Calgary) and per The Globe is coming to Toronto to host the morning drive for CHUM-AM (TSN Radio, 1050 Toronto). And then finally officially confirmed at http://rogersradiointernet.com/hq/newsletters/cache/4336.html. That CP24 simulcast on 1050 was a complete bust. I'm glad to see it dead.